Aurora created YooHoo & Friends to teach children about animals (many endangered) and the environment from which they came...it makes learning fun for them too. They are a large collection of cute fun stuffed animals with big bright eyes and adorable face. Aurora World Inc. has launched a brand new web site for its best selling brand, YooHoo & Friends. 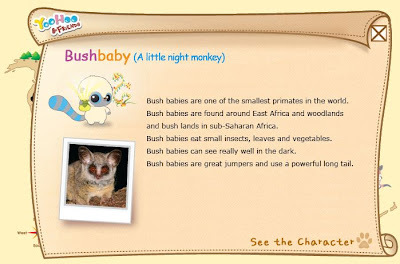 The free, interactive virtual world at http://www.blogger.com/www.yoohoofriends.com requires no activation code and is targeted to children 5 to 12 years old. At the web site, visitors can learn about real animals and their environment, play games, send e-cards, download wallpapers, calendars and coloring sheets, as well as adopt and raise YooHoo & Friends. Additionally, “Design YooHoo’s Next Friend Contest” entries are being accepted now; the contest runs through May 31st. The “Design YooHoo’s Next Friend Contest” encourages children to submit drawings of who they think YooHoo’s (the original character from YooHoo & Friends) next friend should be. Every entry, such as the “pouch rat” is posted on the Facebook fan page. Three winners will receive various prizes including plush toys from the YooHoo & Friends line. Aurora encourages fans of the brand to join them on Facebook and Twitter to see the submission and be the first to get updated on product news, events, and freebies. Aurora World, Inc. is a leading manufacturer and supplier of high quality, competitively priced plush toys and gifts. Aurora’s name reflects its extensive product lines and growing influence in the worldwide marketplace, as well as its international manufacturing, R&D and distribution resources. Founded in 1992, the U.S. company has ascended quickly to become a respected leader in the world’s toy and gift industry. Aurora created one of the nation’s best selling plush lines - YooHoo & Friends™ - and its corresponding free, interactive web site appealing to young children and tweens alike. The company sells its products via a wide variety of retailers including major zoos, high-end toy stores such as Learning Express, top gift chains such as Hallmark and Claire’s as well as hospital gift shops, fine florists, candy stores and gift/stationery stores worldwide. Find a location near you. We were sent 2 adorable YooHoo plush animals. YooHoo is the hero among his buddies. He is a courageous Bush baby from East Africa. These plush little cuties are soft and make a cute little noise when squeezed. They have been little tag alongs with my two youngsters, going where they go, they just adore them! ONE "Mommy? I'm Hungry!" reader will win a 5" YooHoo & Friend's plush pal too! 1. All you have to do is visit their site and tell me the name of any animal on the map and one interesting fact about it! This Giveaway ends: 11:59 pm pst, Friday, May 07, 2010. I wrote this review for "Mommy? I'm Hungry!" about YooHoo & Friends. I received free product to keep for this review. All opinions for this review are that of myself & family. Product info & stock images provided by PR. My favorite animal is the chewoo! Cheewoo is a female squirll and she lives in london! The Tarsier (Josee) spends its entire life in trees. Following on Twitter as maybaby522. Loonee - Snowy Owls will eat as many as five lemmings per day. Shooga: sugar gliders weigh only 4-6 ounces! Libby's origin is Iberian lynx. SaSa is a snow monkey from Japan.